Enterprise-level phone systems managed and delivered as an operating expense versus a capital investment. There are a lot of reasons why larger organizations across the country are moving to Unified Communications as a Service (UCaaS). Buying your phone system “as a service” allows you to write off your systems as a monthly expense (operating expense) rather than depreciating capital equipment (capital expense). If you need to get your office or call center up quickly, then UCaaS or CCaaS is your best bet. 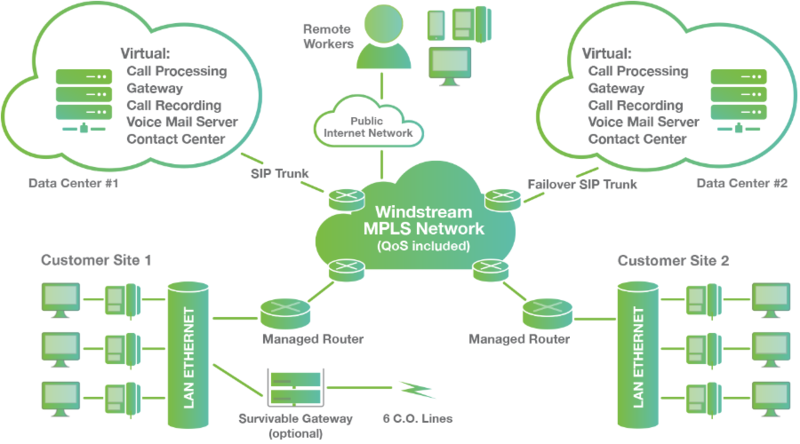 Since it is a managed service, you need fewer high-cost technical staff to operate you phone systems. If you don’t happen to have $500k or more lying around to buy a new phone system then you should definitely check out UCaaS to get the latest equipment, updates, and support. If you need to buy or replace the phone system for your business, you should consider a UCaaS solution. Typically our customers prefer the operating expense rather than a large capital purchase plus a reduction in necessary IT staff as a result. They also prefer the ability to quickly turn up new locations and the overall scalability of the solution.